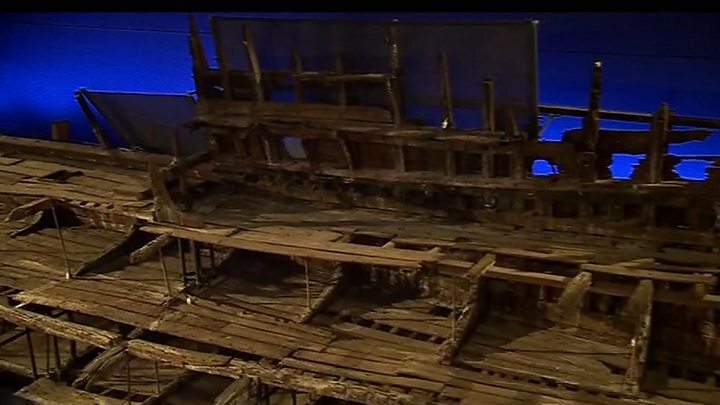 A full, uninterrupted view of the Mary Rose, has been unveiled after a £5.4m museum revamp. Henry VIII's flagship has undergone 34 years of conservation since it was raised from the Solent in 1982. Small viewing panels have been replaced with floor-to-ceiling windows and a balcony entered through an airlock, at the purpose-built museum in Portsmouth. Conservation manager Dr Eleanor Schofield said it was an "emotional" moment. "You think about all the people involved in the project and their commitment and perseverance. It's fabulous to see the ship like this. "It feels like you can reach out an touch it - you get a sense of the compartments and relate it to all the artefacts and the people on board," she added. The warship, which sank in 1545 while leading an attack on a French invasion fleet, was discovered in 1971. It was taken to an atmospherically controlled dry dock where it was sprayed with a mist of cold water, then water-soluble wax, before an air-drying process began. The latest development, which saw the ship close to public view in November, cost about £5.4 million to complete. The £39m museum first opened its doors to visitors in May 2013. The ship goes back on public view on Wednesday. Dr Alex Hildred, head of research and curator of ordnance, who was among those who dived on the wreck in the 1970s and 80s said: "When we excavated the Mary Rose we wanted people to see even a little of what we, as archaeologists, saw and experienced underwater. "The fact that you can see it from three different angles that you've never been able to see before, except for when she first came up, is brilliant." 1510 - The ship is ordered by the newly crowned King Henry VIII and construction begins in Portsmouth. It is launched in 1511. 1545 - On 19 July, at the Battle of the Solent, the ship sinks while leading the attack on the French invasion fleet. 1549 - 1836 - After expert Venetian salvors make unsuccessful attempts to raise the wreck, the ship lies undisturbed for almost 300 years. 1836 - Early pioneering divers, John and Charles Deane, discover the wreck site and raise guns using explosives. They later lose its location. 1965 - A new search for the wreck begins. 1971 - Divers see the first exposed timbers and the site is identified as the Mary Rose. 1979 - 1982 - The ship's contents are excavated by divers and more than 19,000 artefacts are brought to the surface. 1982 - The wreck of the hull is raised. The event is watched live on television by an estimated 60 million people worldwide. 2013 - A £35m Mary Rose Museum opens in Portsmouth. Media captionKing Henry VIII's flagship, the Mary Rose, is unveiled to the public after years of restoration work.